Be independent, be unique, be true to your vision. The cool, crisp tone of ash wood is a bold choice for a dining table. In fact, many wouldn’t have the confidence to pull off an ash dining table in their kitchen or living room. They are a finely balanced marriage between strength and elegance, delicacy and rusticity, modern and traditional. Crafted from exquisite materials that are guaranteed to last a lifetime, an ash dining table from Mac&Wood will illuminate your space with a charm as complex as a sculpture in an art gallery. These gorgeous feature tables combine a refined style with an atmosphere of light, airy spaciousness. Ash is one of the brightest woods, but it’s also one of the most textured. The grain is incredibly varied but also regular and tightly packed. The effect is subtle but somehow clean. 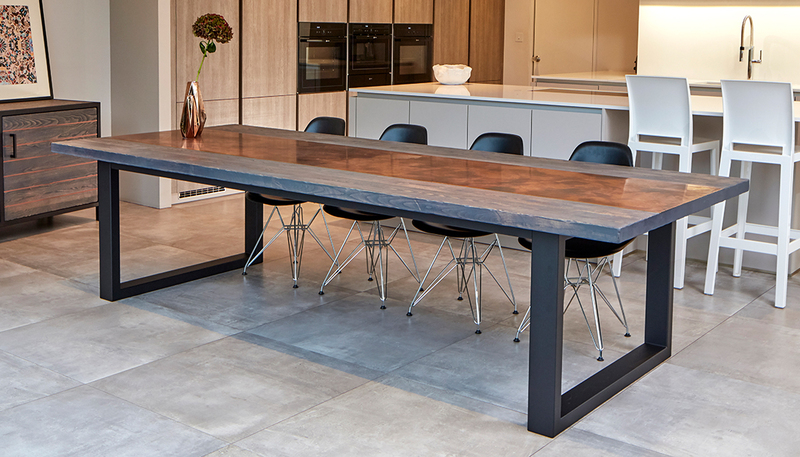 For an understated piece with natural streaks of olive grey or reddish brown that creates a welcoming, all-natural aesthetic, look no further than our ash dining tables. The dining room is a space to gather with family and friends, and we believe that your table should be as versatile and irreplaceable as the individuals gathered around it. Ash is an incredibly dense wood, sturdy enough to resist cracking or splitting under pressure and is naturally resistant to dents. There is a reason it has such a rich cultural history and has been long associated with protective, caring properties in Druidic folklore. Your new dining table will require little maintenance and is sure to take care of you for years to come. If you are someone that values high quality, timelessness and a space that is an expression of who you are, infuse your home with elegance with the help of an ash dining table from Mac&Wood. It will imbue your space with its unbeatable qualities and effortlessly reflect those design values that you hold dear. After all, it takes someone like you to be bold.